Models – Computers are great tools for helping you think,… just never rely on them to do the thinking for you. An un-known amount of un-known’s. How do you model something like that accurately ?? Here’s Hadley Centres Prof. Chris Folland on the subject in 1992: “The data doesn’t matter. We’re not basing our recommendations on the data. We’re basing them on the climate models.” !!!!! If engineers thought or worked like that nothing ( including computers ) would work. It’s impossible, as an engineer, to look at this graph and not rage at the destruction of science that is being wreaked by the inability of climatologists to say the three most important words in life: ‘we were wrong’. And VW did a lot of work under the hood in order to get their engines to pass EPA emission tests !! The idea that these chaotic model results can be used to produce a valid rational projection is beyond absurd. If a model is unable to predict direct observations, then the parameters, variables, or basic theoretical concept must be wrong. July 2013: The UK Met Office reluctantly agreed there had been a ‘pause’ / ‘hiatus’ in the predicted ‘Global Warming’ despite increasing CO2 levels. SCORE: Farmers Almanac — 1. NOAA — 0. 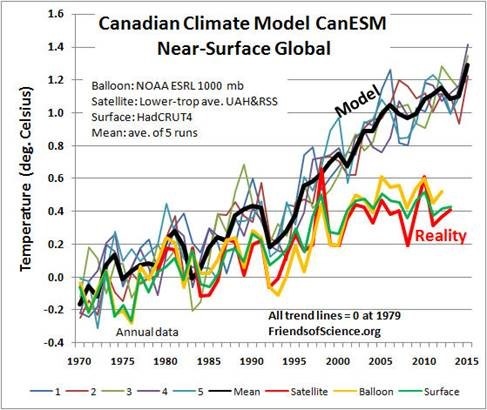 So much for “accurate scientific” models!!!!!! 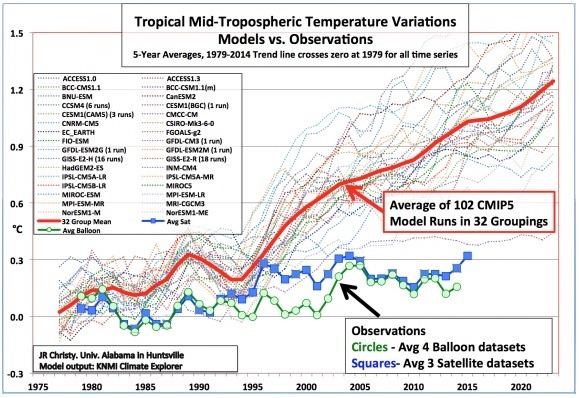 How reliable are the climate models? – Mostly not very ! !